Explore a cidade renascentista de Florença em uma excursão de dia inteiro com um guia privado. Veja as principais atrações como o "David" de Michelangelo na Galeria Accademia, o Duomo, o Campanário de Giotto, a Basílica de San Lorenzo, as Galerias Uffizi e muito mais. Aprenda as histórias e a rica história por trás de cada site que você passa, absorvendo a atenção pessoal de seu guia particular, com um saboroso almoço incluído. Seu passeio começa com a coleta no seu hotel central em Florença. 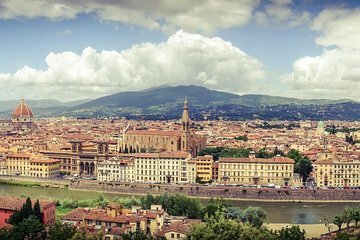 Suba a bordo de um veículo particular e dirija-se primeiro à Piazzale Michelangelo para ter uma vista imbatível da cidade. Depois de tirar algumas fotos, continue a visita à famosa Galeria Accademia, onde você verá o David de Michelangelo e outras obras famosas. Divirta-se explorando a Piazza del Duomo a pé com comentários de guia. Nesta praça popular, você verá as portas de bronze do Batistério, o Campanário de Giotto e a parte externa da Catedral, com sua cúpula icônica projetada por Brunelleschi. Uma vez que você tenha um apetite, desfrutará de um delicioso almoço em um restaurante florentino. Depois do almoço, você irá para San Domenico Fiesole, onde terá acesso a vistas panorâmicas de Florença, Fiesole e do Vale do Arno. O dia termina com uma caminhada pelas ruas históricas perto da Piazza della Signoria, um vislumbre do exterior da Loggia dei Lanzi e uma visita guiada às Galerias Uffizi, onde você poderá ver obras de arte de Leonardo da Vinci e Michelangelo. Seu tour termina aqui no museu. Not worth for price, local guide took us for rid in Van in Florence and we ended in Uffizi gallery where we spend most of time so basically this tour is worth of entry fee of Uffizi gallery which is 30. Please don't buy afternoon Florence sightseeing Tour. The guide was very knowledgeable. For sure a pity that he did not have a microphone, also not the second day after having asked him. The agency apparently only provides microphones for a group of 4 people, which does not make any sense. We were a group of only 3 and considering the masses of people around you with all the noise, only the person walking next to the guide may understand something, the other 2 not at all, so in that regard it was a waste of money to have a private guide, how nice he may have been. Our guide for the day was Ilaria and she was great! We scheduled the tour for our first day in Florence and I am so happy we did because we were able to see all the highlights and then we could plan the remainder of our stay to revisit areas that we learned about on the tour. For example the Uffizi portion of our tour covered the big, and perhaps most noteworthy pieces, but one could return and spend an entire day at the museum. The pace of the tour suited our family of four very comfortably. Well it is a private tour and not everybody can do this but if you can you will not be disappointed. Our guide was wonderful and full of knowledge and passion for Florence. We enjoyed our half day tour and because the line to the Cuomo was too long and my husband and I decided not to go inside she walked us to other areas of the city and we learned about their history. It is nice to be able to customize your tour a little bit. Alesandra was the best guide we have ever had. She was so proud of Florence and you felt her energy in talking about all Florence had to offer. We were with her for about 6-7 hours but she gave us our own private family time as well. She brought us to fabulous mountain sites for great pictures. We went to the Uffizi and Accademia and we visited the areas we wanted based on her recommendations. We strongly recommend the tour and Alesandra. Buena experiencia para alguien desea conocer un poco mas.